Catalign Innovation Consulting: Testing a mindfulness hypothesis #1: Why does he always lie to me? Testing a mindfulness hypothesis #1: Why does he always lie to me? I feel that mindfulness is more of an investigation through the medium of awareness than just a practice. If so, then the question is: investigation into what? This is where mindfulness hypothesis comes to picture. Perhaps there are several versions of hypothesis that can be investigated. In this article, we take one version of the hypothesis and explore how it can be tested. The hypothesis is: Behind every sustained negative emotion, there is a cognitive illusion. is a sustained gap between perception and reality. 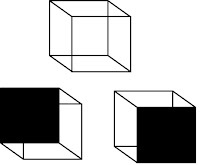 We are all familiar with optical illusions e.g. see the picture of Necker cube on the side. It has two ways in which it protrudes out – to the left and to the right. At a time, you can see only one of the two – not both. And whichever way you see, that’s what feels real. This is an example of an optical illusion. 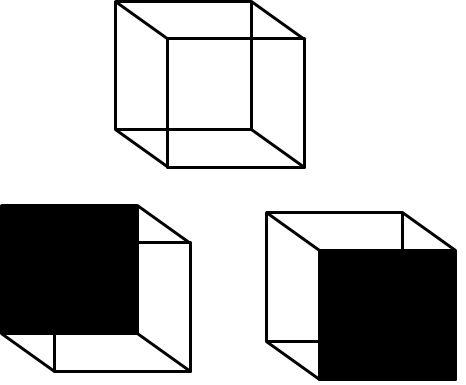 Similarly, we may feel one person right and the other person wrong in a situation and it could also be, like Necker cube, an illusion. You feel, one person is right because you see it only one way. A cognitive illusion typically involves misattribution – an incorrect cause-and-effect relationship created by thought process. Let’s take an example that came up in my workshop. Whenever someone close to me (spouse or a close friend) lies to me – then I get upset. And when the person lies repeatedly, then I get mad. Now, mindfulness hypothesis says that since there is a negative emotion involved here (getting upset and mad), there is a cognitive illusion lurking behind. How would one begin to investigate into this situation? Note that before any such investigation can begin, a doubt should be entertained first, “Could I be wrong?” In the absence of this doubt, there is no beginning. Perhaps it would help to see how we learn about a magician’s magic. If you watch a YouTube video of a magician, and see the comments from viewers, many times, you will see people pointing out specific time e.g. 2:29 where the magician is doing some sleight of hand (e.g. see this blog on Penn and Teller Fool Us). Of course, if you watch the video in regular speed, it is difficult to see the trick. But if we run the video in slow motion then it becomes easier to see. Similarly, is there a way we can run the story in slow motion and check the “sleight of hand” of the thought? One way to do this is to simulate the situation – in this case – spouse or friend lying to me – when I am seated in a cosy environment – say drinking a cup of coffee at home and see if the anger still simmers up. Watch how the tape of how he is doing this on purpose is playing again and again and how that still upsets us. This happens in spite of the fact that it is coming purely from memory. This simulation may help us see that springing up of a negative emotion may be an automatic process – almost mechanical. Once we see this automaticity (if we see it), then we can ask the next question: Can the thought that led to my friend’s behaviour of lying to me be also an automatic response? How do I know if there was a choice involved? Some of these questions might lead us to observe the compulsions under which all of us are trapped. And we may see the futility of holding him responsible for the behaviour. Of course, the crux lies in identifying such situations that upset us and carrying out these tests through run-time observation. Just carrying out an intellectual exercise would not help. One needs to pay attention to the train of thought as it moves around in these situations.